City officials began Tuesday to roll out a plan to reduce speed limits on downtown and residential streets. 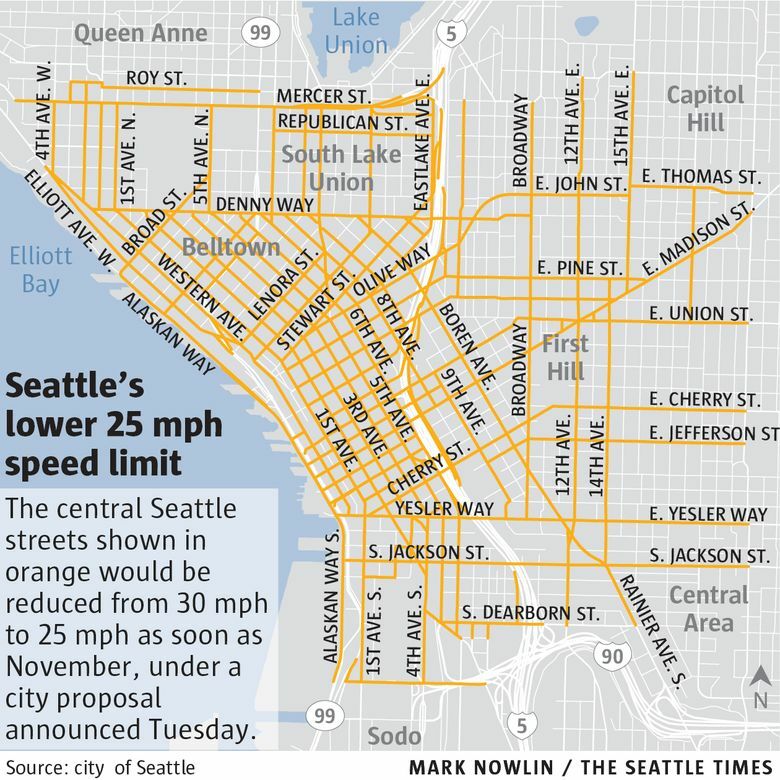 The speed limit on main streets in and around downtown Seattle likely will be reduced late this year to 25 mph, and the residential speed limit to 20 mph, in an attempt to reduce traffic injuries, city officials said. Assuming the City Council approves this month, road crews would begin putting up 500 new signs in November, at a cost of $200 to $300 each, said Scott Kubly, director of the Seattle Department of Transportation. In addition to downtown, arterial speed limits in South Lake Union, Uptown, Capitol Hill, First Hill and the Chinatown International District would be lowered to 25 mph. “Vision Zero” is the nickname for traffic-safety efforts in Seattle and other cities including New York, Los Angeles, Portland and San Francisco. A “20 is plenty” movement has spread among walk-bike supporters worldwide. Tougher school-zone enforcement, eliminating un-signaled crosswalks on four-lane streets, speed bumps of various sizes, protruding sidewalks, and “road diets” that narrow four-lane streets to three, are common tools. 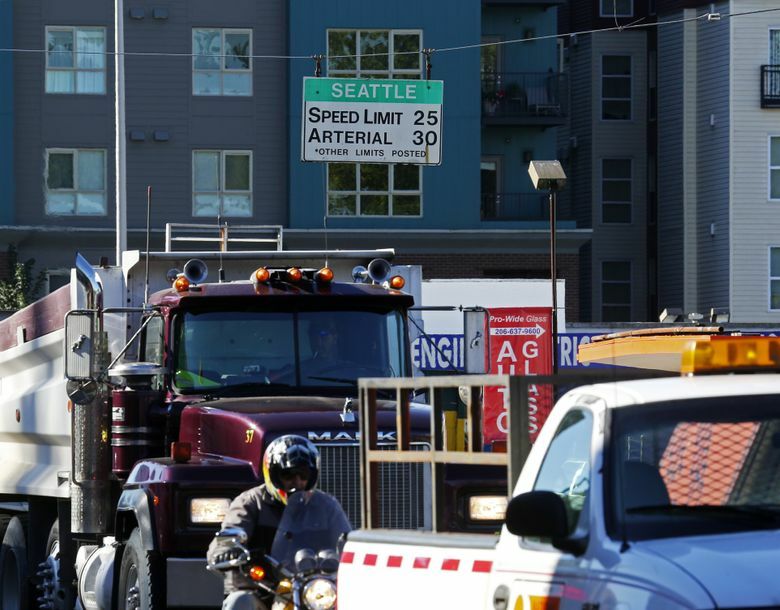 Seattle’s move, announced by City Councilmember Tim Burgess at noon Tuesday, follows a council vote by similar-sized Boston to lower its default speed limit from 30 mph to 25 mph, effective Jan. 1. The news conference was held next to Horizon House on First Hill, home to 500 senior citizens and 300 staff, where pedestrians and for-hire vehicles constantly mix with traffic on a tree-lined side street. A major problem for Seattle will be whether the city’s traffic unit of about 60 members can effectively enforce lower speeds. The traffic unit already struggles with Mercer Street gridlock, conducting crosswalk stings citywide and consistently clearing the bus lanes leaving downtown. SDOT says there will be targeted police patrols. Based on past safety programs, police spokesman Patrick Michaud said he would expect an education phase, and a grace period in which officers issue warnings to speeders, before fines take effect. An ordinary speeding ticket is $136. Currently, standard speed limits are 30 mph on Seattle arterials and 25 mph on residential side streets, unless otherwise marked. As a practical matter, many residential streets have room for only one car to travel, or have so many blind spots that careful drivers slow to 15 mph. Likewise, many commuters feel blessed if they can even progress at 25 mph in thick downtown congestion. Kubly acknowledged drivers rarely hit 25 mph at peak times but said the change will improve safety at night when roads are more clear yet pedestrians are still out and about. Mayor Ed Murray previously promised to reduce downtown speeds by the end of 2015, but the goal slipped several months. Kubly said Tuesday that the SDOT chose to wait until downtown traffic lights were retimed for 25 mph, which was done last New Year without fanfare, followed by studies in 2016 to confirm the retiming didn’t reduce traffic flow. And the initial 25 mph zone will stretch as far as a mile beyond downtown. That way, longer stretches of roadway will continuously have the same limit, spokesman Rick Sheridan said. Traffic-collision studies show that a person struck at 20 mph has a 90 percent chance of survival, nearly twice as good as someone hit by a vehicle traveling 30 mph. Seat belts, air bags and other safety features have reduced driver injuries, but bicyclists and walkers aren’t shielded. 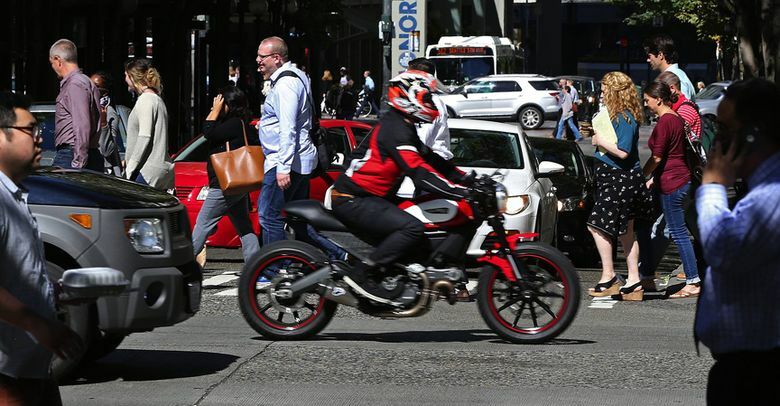 “The equivalent of that for pedestrians is smart streets, the environment around you,” said Dr. Beth Ebel, director of the Harborview Injury Prevention & Research Center. Cities gained authority to enact 20 mph residential speeds in a 2013 state law sponsored by Rep. Cindy Ryu, D-Shoreline. Seattle launched a few experimental 20 mph zones last year near McClure Middle School on Queen Anne Hill; Bailey Gatzert Elementary near Yesler Terrace; Lafayette Elementary in West Seattle; and the public library in Lake City. The City Council earlier planned to convert more places to 20 mph, as neighborhoods requested that. But Councilmember Mike O’Brien said it’s sensible to just change residential speeds citywide, for equality and to reduce red tape. Slow-street efforts do raise questions or problems. Do drivers diverting to side streets cause new hazards where children and seniors are accustomed to bike or walk? Some motorists see lower limits as a pressure tactic to get people out of their cars, which is an aspiration among city leaders. Asked about that, Kubly denied SDOT is waging a “war on cars,” noting that a drop from 30 to 25 mph adds a minimal amount of travel time. O’Brien said he hears from many people who wish to change how they travel, to bike or walk more places, if only the roads were safer. Another question is what happens on Martin Luther King Jr. Way South, where Jim Curtin, SDOT traffic- safety coordinator, pledged to lower the 35 mph limit to 30 mph, after two children walking were severely injured in hit-and-run crashes. Changing the speed limit on MLK would hinder Link light rail, whose trains are designed to cruise at 35 mph using signals timed to support six-minute train frequency. The situation on MLK Way is still being studied, Curtin said. Other arterials, such as Delridge Way Southwest, were already road-dieted most of the way, but also allow 35 mph stretches mixed with 30 mph segments, four-lane intersections, and school zones — so the challenge is to keep people from speeding where lanes are relatively wide. Early data from a Rainier Avenue South lane reduction, in the Columbia City area, show safety gains after the first year, he said. Lower speeds represent a partial solution for certain hot spots, such as four-lane Denny Way near downtown, where drivers stop unpredictably to make left turns, and pedestrians use so-called “unmarked crosswalks” by walking between surges of cars. Generally speaking, Vision Zero purports to reduce crippling traffic injuries to zero by 2030. Seattle remains far behind the pace. Last year, 130 people were seriously injured, the Seattle Bike Blog reported, and 20 died on Seattle streets last year. Weaknesses in state law make it difficult to file criminal charges in car-pedestrian crashes unless the driver is drunk. Nationally, a surge in overall driving, and distracted driving, are blamed for a rise in fatalities. An estimated 35,200 people died in U.S. traffic last year, a 7.7 percent increase from a year earlier.